Why Visit Ho Chi Minh City? 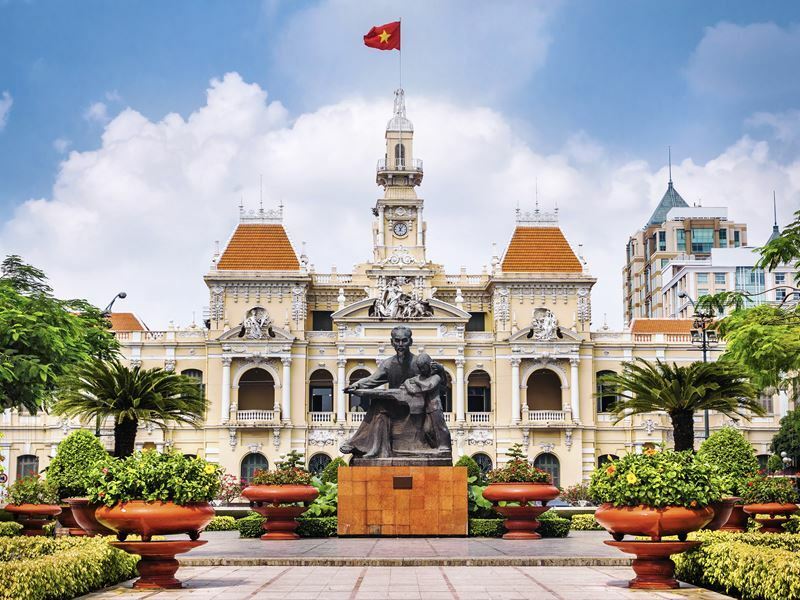 Officially Ho Chi Minh City, but known as Saigon to the locals, this is Vietnam’s largest metropolis and a vibrant cultural, historical and economic hub. In this tropical southern city, motorbikes outnumber people and the streets are filled with trendy rooftop bars and shiny offices, as well as ancient pagodas and palaces. From war museums to food tours and temples, here are the top 10 things to do during your stay in Ho Chi Minh City. What: Saigon is full of museums where you can learn about Vietnam’s fascinating history and culture. Start at the National History Museum, which takes you back to the Bronze Age and tells the story of the nation and all its many cultural influences and ethnic groups. Artefacts include Cham art, relics from Angkor Wat and Chinese jewellery. Art lovers should head for the Fine Arts Museum, while The Museum of Traditional Vietnamese Medicine (FITO) gives a glimpse into Chinese-influenced healing methods. Learn about the life of Vietnam’s most important leader at the Ho Chi Minh Museum where you’ll find some of his personal possessions, including his radio and sandals. For a riveting glimpse into the lives of Vietnamese women, including their role in the communist revolution, visit The Women’s Museum in district three. 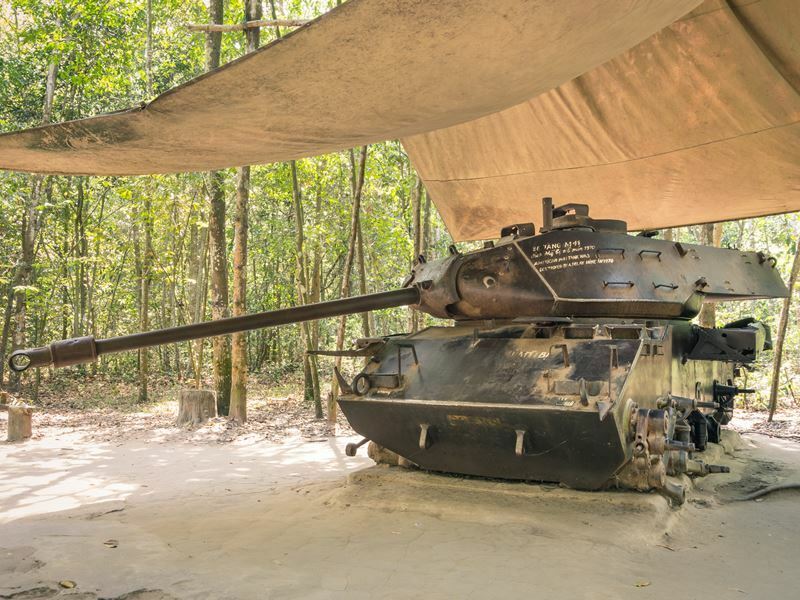 Highlights: The War Remnants Museum is the most-visited in the city and offers a brutal look at the devastating effects of Vietnam’s past conflicts. On the ground floor, you’ll find a photo exhibition of the worldwide Vietnam anti-war movement, while the upper levels tell disturbing stories of war crimes committed by US forces. These include the infamous My Lai Massacre and deadly use of the chemical weapon Agent Orange. Don’t miss The Requiem Exhibition, which commemorates the many photographers and journalists killed during the war. 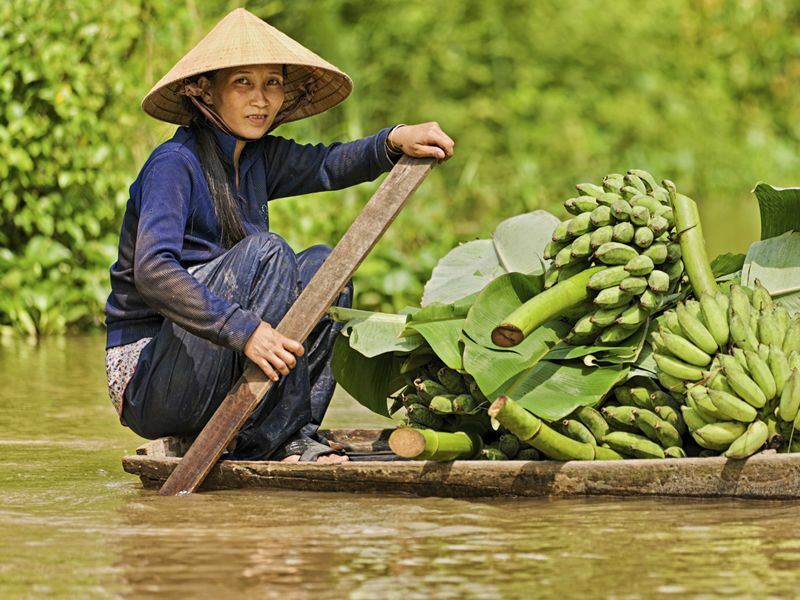 What: Take a day trip from Saigon to explore Vietnam’s rice bowl, the Mekong Delta. Over a third of the country’s annual rice quota grows in this fertile area where the Mekong River divides into nine small tributaries. Float down the waterways in a wooden Sampan boat past lime-green rice paddies, villages and fruit orchards. On the way, look out for fisherman trawling the waters and farmers picking rice in conical hats. Can Tho, which lies at the heart of the Mekong Delta, is one of its largest towns and the ideal place to start your boat trip, but you can also cycle along the river bank to see decorative pagodas, rice-paper factories, craft workshops and hamlets. Highlights: Visit a floating market to experience a real slice of Vietnamese life. Watch people trade and barter, try some traditional snacks from a food vendor and buy some handmade gifts to take home with you. What: Ho Chi Minh City is full of enchanting temples, pagodas and churches belonging to a variety of faiths. One of the most majestic is Mariamman, the only Hindu temple in the city, which was built in the late 19th century by Indian traders in honour of their rain deity. Its striking outer wall is decorated with brightly-coloured statues of gods and goddesses. Giac Lam Pagoda is the oldest Buddhist temple in Saigon, built in 1744. Visit for its striking dragon statues, ornamental ceremonial halls and 32-metre tall stupa. Be sure to see the most exquisite Chinese temple in the city, Thien Hau in Cholon, which is dedicated to the sea goddess Mazu who is said to protect sailors and fisherman. Highlights: The Jade Emperor Pagoda is the most famous in Saigon and perhaps the most beautiful with its curvy silver roof, unusual statues and elegant wooden carvings. This Taoist temple was built in 1909 by the city’s Chinese community in honour of their most sacred god Hgoc Hoang, the Jade Emperor. What: When it comes to food, Ho Chi Minh City offers the best regional dishes from across Vietnam, as well as its own specialties and tasty street food. 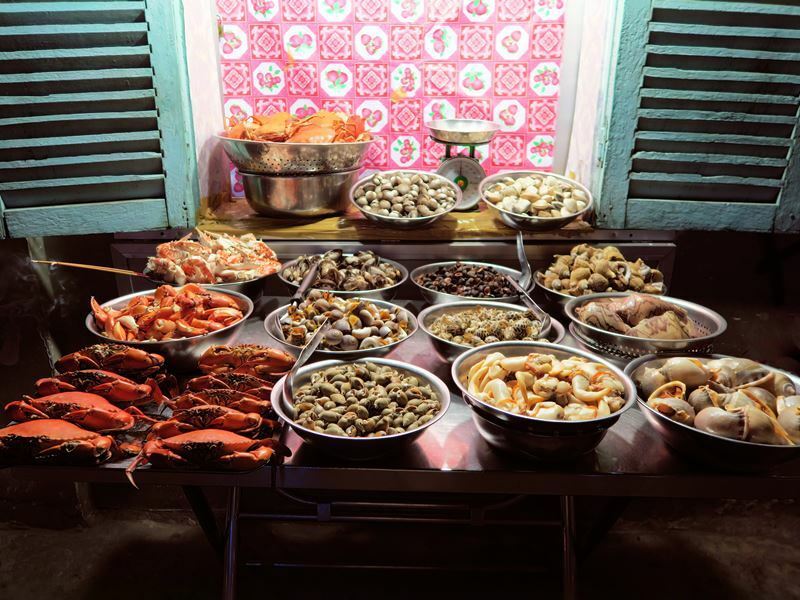 To get your teeth into traditional Vietnamese cuisine take a food tour where you’ll stop at the best street carts and restaurants in the city. Sample street snacks like Banh Xeo, crispy rice-flour pancakes made with coconut milk and stuffed with savoury fillings, and Goi Cuon, delicious spring rolls. Com Tam is a typically southern dish worth a try, made from broken rice grains and usually served with pork, eggs and greens. Other treats include a Banh Mi pork sandwich or plate of Oc, a shellfish dish that could contain anything from clams and shrimps to sea snails and crabs. Highlights: No trip to Vietnam would be complete without a bowl of mouth-watering Pho. This seasoned rice-noodle soup can be made with either chicken, beef or pork and is served with bean sprouts, leafy greens and lime wedges. Eat Pho like the Vietnamese do, as a breakfast dish. What: If you love shopping, then you won’t be disappointed by Saigon’s markets. Most visitors head straight for Ben Thanh, but Antique Street (Le Cong Kieu) lies just across the road and sells a range of colonial memorabilia, art and Buddha statues. 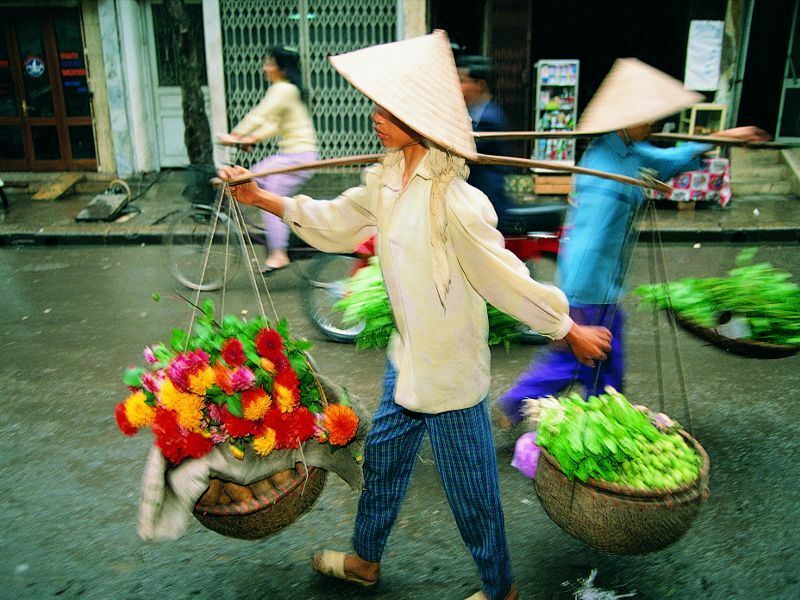 For a more authentic Vietnamese experience, head to the Ho Thi Ky Flower Market in district 10. Here you’ll find fresh flowers such as lilies, roses, lotuses and orchids from across the country, particularly Dalat and the Mekong Delta. Binh Tay Market in Chinatown is where locals come to buy their produce and meat, but upstairs you’ll also find handicrafts, lacquerware, food stalls and fabrics. If you’re looking for something completely different, you can’t get more unique than Dan Sinh, also known as the War Surplus Market. This is the place to go for gas masks, boots, canteens, flak jackets and other war-era goods. Highlights: Trawl through the treasures at Ben Thanh Market. Located in district one, this is the city’s oldest surviving market and one of its most famous icons. Ben Thanh’s history can be traced back to the 17th century when street vendors operated in the area, but it was converted to an indoor market by the French in 1870, who named it Les Halles Centrales. Nowadays, Ben Thanh has everything from souvenirs and clothing to produce and kitchenware. There are also food stalls to buy cheap snacks and a night market outside that runs until midnight. Where: Ap Phu Hiep, Phu Hiep, Phu My Hung, Cu Chi, Ben Tre 733800. What: Take a day trip from Saigon to the Cu Chi Tunnels, which were notoriously used by the Viet Cong during the American War. The network of underground tunnels is 120km long and dates back to the 1940's, when Vietnamese soldiers used them to fight against the French occupation. Later, they were expanded and used as shelter from American bombs as well as weapon caches, communication routes and even living quarters for Vietnamese fighters and locals. Today, visitors can see the unbelievably tiny trapdoors which lead to the original tunnels and learn about war tactics and booby traps employed by the Viet Cong, including menacing spike-fitted traps. There’s even a firing range where you can have a go at shooting an M16 assault rifle if you wish. Highlights: Sections of the Cu Chi tunnels have been widened and coated with cement so that tourists can crawl through them and get a taste of what it was like to live and fight in this unique environment. Where: 1, Cong xa Paris, Ben Nghe, District 1. What: Notre Dame Cathedral is a relic from Vietnam’s French colonial era and one of Saigon’s most well-known and beautiful landmarks. The cathedral was built in the late 1880's and given basilica status by the pope in 1962. Today, it’s one of the few catholic churches left in Vietnam and stands nearly 60 metres tall in the city’s Paris Square. 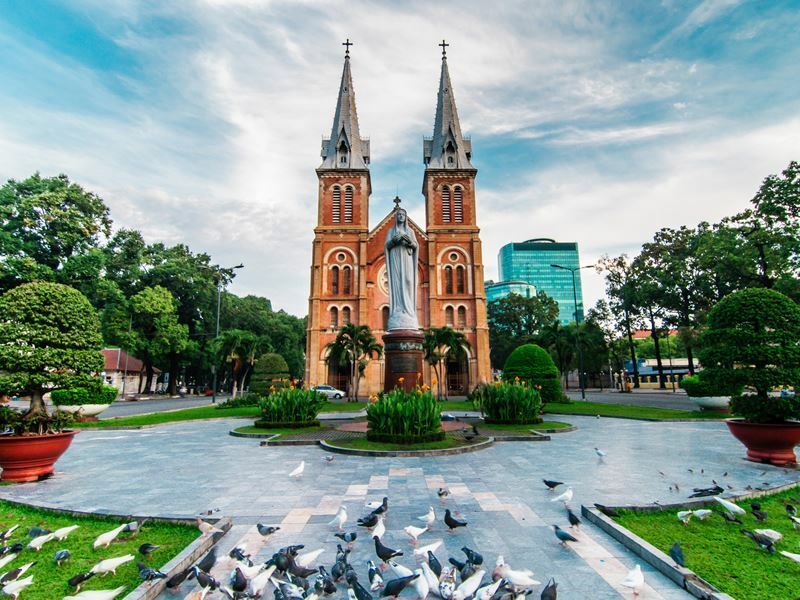 Like the original Notre Dame Cathedral, Saigon’s version has neo-Romanesque design features with distinctive red bricks imported from Marseille, stained glass windows and two spike-tipped towers that each have six bronze bells. Highlights: Visit the cathedral during English mass on a Sunday at 9.30am. Don’t forget to check out the statue of the Virgin Mary which stands in front of the cathedral, worshippers claim that it shed tears in 2005. What: Cholon is Vietnam’s largest Chinatown, located on the west bank of Ho Chi Minh River. It dates back to 1778 when Chinese minorities hid in the area during conflicts and later settled there to make a living from selling Chinese products. During the American War, Cholon also became well-known as a black market for US soldiers trading in army supplies. Today the area retains its Chinese identity and has a distinctly different feel to the rest of Saigon. Wander the streets to see classic Chinese architecture, including ornate red-and-gold temples like Quan Am. Bustling Binh Tay Market lies at the centre of Cholon, where traders sell everything from fresh produce to household goods. While exploring Cholon, stop at one of the Chinese restaurants or food carts selling salted duck eggs and roasted duck and pork dishes. 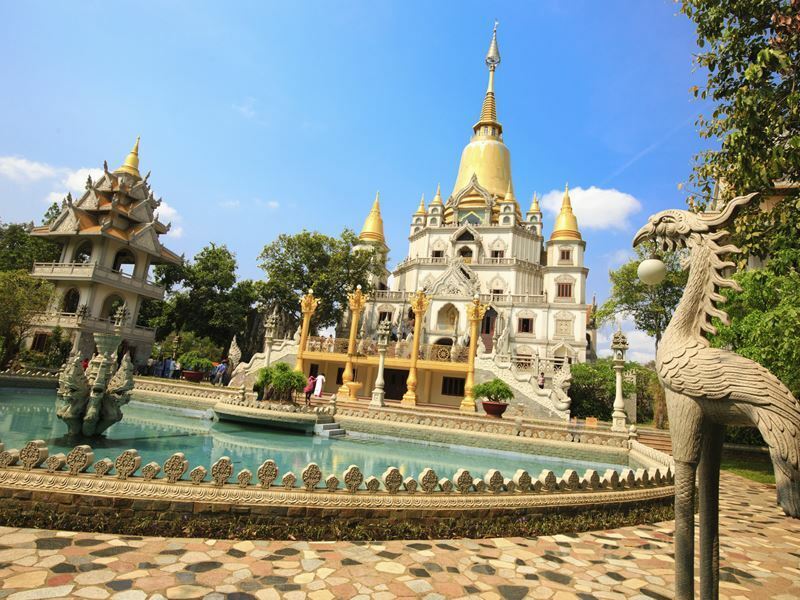 Highlights: Shop at Binh Tay Market and visit Thien Hau pagoda, a stunning 18th century temple dedicated to the Chinese goddess of the sea, Mazu. Take in the incredible Chinese-Buddhist style architecture which is decorated with porcelain figures from Chinese legends, statues of Mazu and huge stone incense-burning bowls. 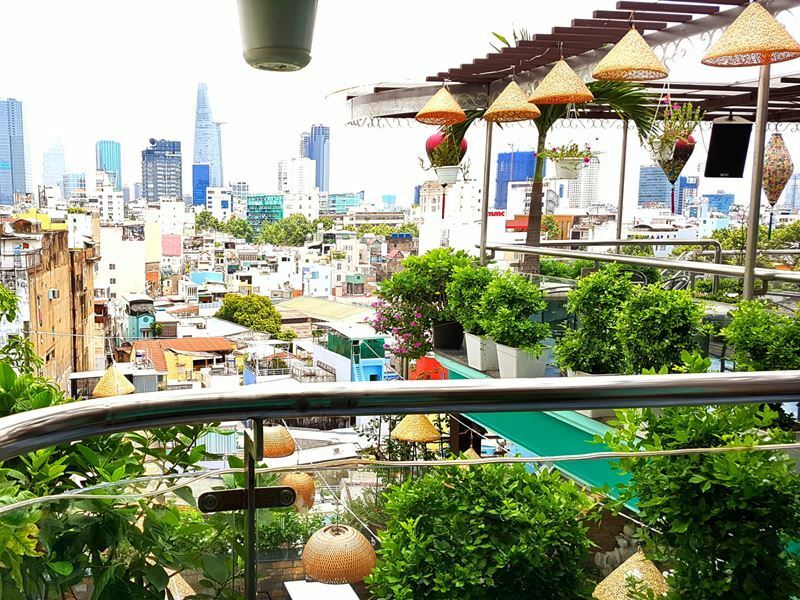 What: Ho Chi Minh is Vietnam’s nightlife hotspot and has something for everyone, whether you want live music, cocktails with a view or a street-side beer. The city has some of the best roof-top bars in the world, with chic modern designs and impressive panoramic views of the city lit up at night. Some of the most popular rooftop haunts include swanky Chill Skybar and The View Rooftop Bar. For a more low-key night out, pull up a plastic stool with the locals for a glass of Bia Hoi, the nation’s lager-like draught, on Pham Ngu Lao Street. You’ll also find a range of live-music venues, backpacker pubs and even casinos across Saigon. Highlights: Head to the EON51 Heli Bar on the 51st floor of the Bitexco Financial Tower, which is the highest point in the city. From here you can enjoy the best 360 degree views of the city while sipping a drink in this ultra-stylish bar. Where: 135 Nam Ky Khoi Nghia, Ben Thanh, District 1. 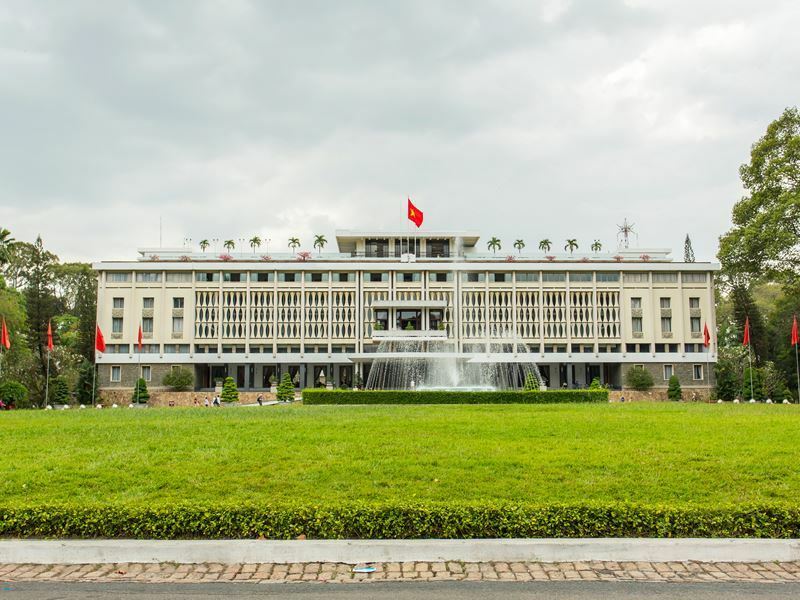 What: Also known as Independence Palace, this striking building marks a key moment in Vietnam’s history. On the 30th April 1975, the city fell to Ho Chi Minh’s communist army when tanks crashed through the palace gates and soldiers stormed the building. 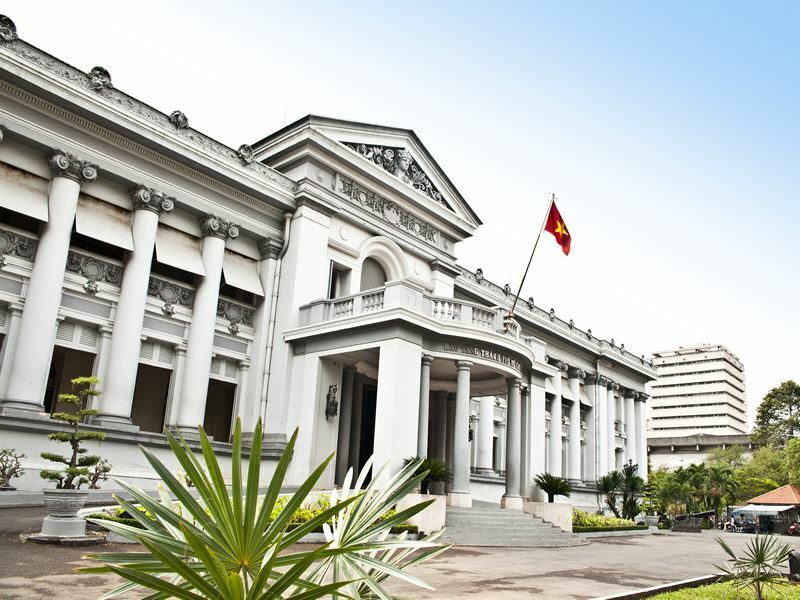 Historically, the site dates back to 1868 when it was a residence for a French governor and it later became home to the southern Vietnamese president, Ngo Dinh Diem. The leader was so unpopular he was killed by his own army, who bombed the palace into ruins. The existing palace was re-built in 1966 and is a time capsule of that era, when it was home to president Nguyen Van Thieu until reunification. Visitors can explore the perfectly-preserved meeting and reception rooms, lavish presidential quarters and card-playing rooms - there’s even a cinema and helipad. Highlights: Wander through the palace’s eerie basement tunnels where you’ll find command bunkers outfitted with strategic war maps, propaganda materials, antique furniture and old radio transmitters and telecommunications equipment. Once you’ve finished soaking in Hi Chi Minh City’s cultural delights, why not explore the rest of the country? Our Best of Vietnam tour will take you to white sand beaches, historic towns, lush rice terraces and UNESCO bays.